Great job, Teresa! Maybe you should touch base with Raul to see if you can pick his brain. He’d be a very credible source wouldn’t he? Thanks Hillary. And Dr. Pacheco’s tips that resonated with you are ones that you already incorporate in the other online spaces you occupy! Well what a nice thing to say! Thanks Andrea. 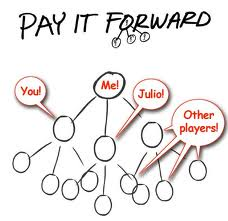 I think of it as “pay it forward” too! And I agree, it’s a nice way to live one’s life, both personally and professionally. Ain’t the internet grand?! You are a role model for that concept! Walking the talk.